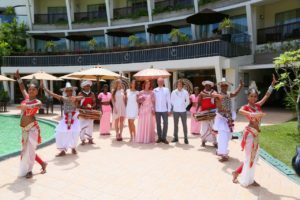 In Sri Lanka, we can offer you a wedding in a beautiful boutique hotel or in a big luxury complex. All wedding packages don't include hotels, plane tickets or transfer. We have around 35 different packages and options, so please contact us for more information. We can offer an option that will complete your dream and expectations from your special wedding day. The Ceremony is compulsory for every wedding. The boutique hotel and weddings with a large number of guests may not be possible during certain periods. Registration will be conducted by a Government of Sri Lanka authorized person. An official English translation of the certificate will be provided. If the registration is acceptable in your country, we will provide a copy certified by your foreign mission provided such certification is issued by the foreign mission. If you need consultation and personal offer exactly for your wedding, please contact us here. 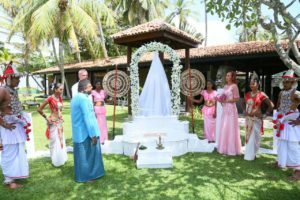 When is the best time to marry in Sri Lanka? 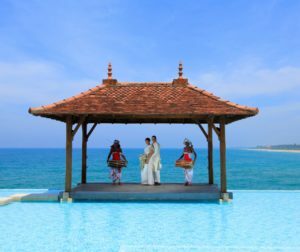 Sri Lanka is a tropical country so expect lots of blissful sunshine and blue skies practically year-round. The island has 2 monsoon seasons: the northeast monsoon (December to March), and the southwest monsoon (June to October). While there are “rainy seasons”, it will pour in the evening and the sun will be out the next day. Sri Lanka has a few different climates so you can bring a sweatshirt because in the hill the temperature can drop to 14-17 degrees Celsius in the mornings and evenings.